Limited Warranty of Workmanship – Fast Change Lube & Oil, Inc.
Our workmanship is warranted against failure for 1,000 miles or 30 days from date of service, whichever occurs first. Customer shall immediately cease operating the vehicle in the event of fluid leaks, illumination of oil warning light, gauge(s) loses pressure, or unusual noises after service has been rendered. Continued operation of vehicle under such conditions will render the Limited Warranty null and void. Should any problems occur, the Customer shall immediately notify Fast Change Lube & Oil, Inc. (“Fast Change”) and give Fast Change the initial opportunity to inspect and cure any defects. Tampering with or any alteration of Fast Change’s products, or the manufacturer’s original equipment, or initiation of repair work by another party prior to notification and inspection by a Fast Change representative will render the Limited Warranty null and void. Customer must present his or her invoice, together with a sample of any product involved to support a claim. The Limited Warranty does not include any financial responsibility by Fast Change for a car rental, loss of times, loss of use of vehicle, loss of earnings, or any other incidental loss. This Limited Warranty does not cover the defect, damage or deterioration due to normal use, wear and tear or exposure. Further, Fast Change does not warranty transmissions or radiators with mileage in excess of 80,000 miles. Transmission fluid exchange services performed on vehicles is a preventative maintenance procedure designed to keep your vehicle’s transmission fluid clean and operating smoothly. This procedure is not intended to correct any type of transmission problem, i.e. slipping, hard shifting or failure to shift gears. If your vehicle is experiencing any type of transmission problem, it is recommended that the problem be diagnosed by a certified transmission professional and corrective action taken as necessary. A preventative maintenance transmission service will not correct a transmission problem and in fact may make the symptoms more severe. This procedure is completely safe for a transmission that is in sound condition and that has been properly maintained. This service is recommended preventative maintenance for your vehicle. Cooling System Fluid Exchange Services performed on vehicles is a preventative maintenance procedure. This procedure is designed to keep your vehicle’s cooling system clean and free of rust, scale deposits, and to renew your coolant. This procedure should be performed in accordance with the manufacturer’s recommendations and your driving conditions. Please keep in mind that this service is not intended to correct an overheating problem, a clogged radiator, failing water pump or malfunctioning thermostat. If your vehicle has been overheating, we recommend the source of the overheating be investigated and corrective action taken before this service is performed. A vehicle that has been overheated is subject to severe damage and in most cases a cooling system service will not correct the overheating problem. Additionally, it is possible that a “flushing” process will fully expose problems such as a cracked or weakened head gasket or intake gasket, worn water pump, deteriorated water jackets or radiator. The Cooling System Service is completely safe for a cooling system in sound condition and is recommended preventative maintenance for your vehicle. Any implied warranty of merchantability or fitness for a particular purpose is limited to the duration of this limited warranty. Some States do not allow limitations on how long an implied warranty lasts, so the above limitation may not apply to you. Interstate Batteries® (IB) provides this limited warranty to (1) the original retail purchaser, (2) of the Interstate Batteries branded battery models listed in the Chart below, (3) when purchased from an IB Authorized Dealer or an All Battery Center Store in the 50 States of the United States or the District of Columbia. 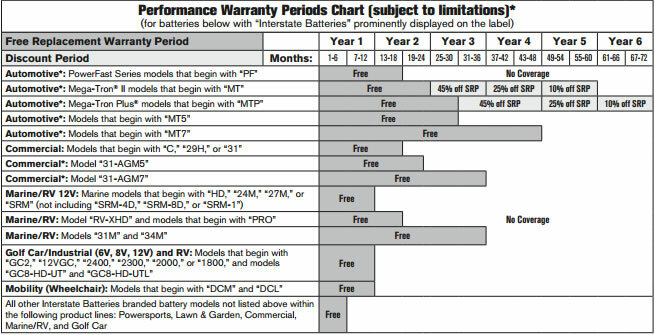 IB warrants that your battery is free of defects in material and workmanship for the duration of the warranty periods listed for your battery model in the Chart below. IB’s Performance Warranty has a Free Replacement Period, and some battery models have an additional Discount Period. If your battery fails due to a defect during the Free Replacement Period, you may obtain a free replacement battery. If your battery also has a Discount Period and fails due to a defect during that Discount Period, you may purchase a replacement battery at a discounted price. Your discounted price will be IB’s Suggested Retail Price (SRP) for your replacement battery model at the time you return your original battery, minus a percentage discount as shown on the Chart below. Any replacement battery you obtain under this Performance Warranty must be identical or reasonably equivalent to your original battery. To find IB’s SRP for your replacement battery model when you return your original battery, ask your dealer or check IB’s website at www.interstatebatteries.com. The SRP in effect on the date you return your original battery will not be the same price you paid for your original battery, and the SRP may be different than the dealer’s actual selling price for your replacement battery. In some cases, dealers may have different pricing structures and voluntarily offer to sell you a replacement battery during the Discount Period for a lower price. You will still need to pay any taxes and legislatively imposed fees on your replacement battery, and you may also need to pay labor and installation charges. Any warranty coverage that remains on your original battery (when you return it for a replacement battery under this Performance Warranty) will carry over to your replacement battery. Your replacement battery will not have any new or separate warranty coverage. To obtain a replacement battery, you must present your original battery to an IB Authorized Warranty Dealer or All Battery Center Store that has an appropriate replacement battery in stock. That dealer will have a reasonable time to test your original battery and, if defective, replace it according to the terms of this limited warranty. To find the IB Authorized Warranty Dealer or All Battery Center Store nearest you, and to get the phone number of that dealer or store, visit www.interstatebatteries.com, or call 800-CRANK IT (800.272.6548) for Automotive, Commercial, and Marine/RV batteries or 888.772.3600 for all other Starting, Lighting, and Ignition (SLI) batteries. For a printable PDF version of our warranty statements click here.